Spin the Bobbin: Giveaway Day! 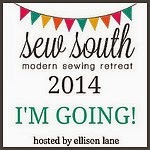 I'm so excited to be joining in the fun at Sew, Mama, Sew! Giveaway Day. In fact, this is my first giveaway since I started my blog in April. I'm giving away a bundle of FQ "Countdown to Christmas" by Sweetwater for Moda. I'm also giving away a charm pack "Hometown" by Sweetwater for Moda. So, if you'd like to win this giveaway, comment back to me your thoughts on Christmas cards. I love to receive them every year and I'm noticing that every year we get fewer and fewer back. I love sending cards out every year. This year I couldn't round up our kids so it is just my hubby and I along with our 2 furry boys. I couldn't help but add our 3 grandsons at the bottom. This giveaway is open to all.....even international. Giveaway is open until 8pm EST on Friday, 12/16. I will pick a winner using the random number generator. 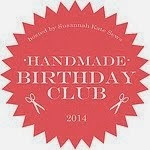 Make sure you link up to Sew, Mama Sew and check out everyones giveaway. We don't do christmas cards... but I think it's a great tradition as family and friends get to see kids grow each year ! I love to send and receive Christmas cards, but it is a lot of work! So we don't send one every year. I try to send cards every year, just because I think it's a nice little sentiment to the holiday. I love hearing from all my friends, and what's gone on in their lives over the last year. PS- I love the fabric you're giving away. Sweetwater comes out with a good fabric line every time. I love sending and receiving holiday cards! We do a picture (similar to yours with our family). I think that it's a great way to write a little something to people you might be a little out of touch with - equally true, it's wonderful to hear news from people you haven't seen in a while! I like Christmas cards, however, I haven't sent any out this year, due to a limited budget. I have cards, I bought them after Christmas last year...but I didn't realize they require extra postage. =( Anyway, that's my take. I do send cards but can't always send as many as I'd like! I don't send Christmas cards every year (I try for every other) but I do love to get them in the mail. So despite the fact that there are cheaper ways to send cards (e-mail, not at all) I'll continue to send my Christmas cards snail mail, until the Postal Service is no more! pick me, pick me...I love your giveaway and your card it so cute. I'm with you on the card thing. We send out about 30% more than we received, but that's ok. I love sending them. I now send cards only to my family members who live quite far away. It used to take what seemed like days to send my cards out a longggg time ago. I gradually cut down and saved lots of time & money, too! 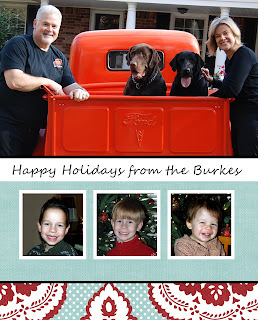 I think your photo card is wonderful with the truck, your two cute Labs and you two beautiful people (plus the 3 cutie-pie grands)! My mom still sends them out. Next year by Christmas I'll be married, so we'll have to send our first ones! I love Christmas cards - I send them out every year. I also love receiving them and this year my parents added their grandkids too as a special calendar to put on the fridge - I liked that a lot! I will always send christmas cards, I think it's still the classy way to wish someone the very best at the holidays! I still send out cards and I love to get them too. Sometimes it is the only time you hear from someone far away. I love to get Christmas cards -- even the wordy, two-page newsletters. We send out cards too - although usually just with a picture on front and a hastily scribbled "Merry Christmas." I still send out cards, but not as many as people would hope. I like to keep it special and not just mail out 100-200 cards. Only close family and friends. I love sending out cards. I make sure that we send them every year, even to people who don't reciprocate. I know what a joy it is to receive them, so I want to make sure and send them to those I love. I love Sweetwater fabric so this is a great giveaway for me! I love picture holiday cards - I hate the generic ones! I LOVE Christmas cards, but we, too, have failed to send them out the past few years. We've been moving from place to place, and now I worry that we will have trouble finding everyone. Hope you receive bunches and bunches in your mailbox this year, and thanks for the opportunity to participate! Love HOMETOWN! I like getting Christmas cards, but I hate sending them. So much work. But alas, it has to be done! Thanks for the giveaway! I LOVE sending cards. For me, it's an excuse to show off my daughter. I agree, though-- I am getting less and less. I love snail mail, especially cards, and wish it wasn't true. I love receiving Christmas cards with family pictures on them! I am not so good at the sending part! now that we're older we do cards every 2 years and it seems to work well, but when we were young, every year is necessary, people change too much! i like getting them and sending them! I send cards to people I won't be seeing, but make the effort to handwrite a little note in each - takes forever! I love getting all mail, and am pretty noisy about this so most friends/family recipricate! Thanks for the cash! I like getting cards but I am horrible about sending them. I make them every year but then we don't get around to sending them out. This year we were good and made sure to get them sent out early so we didn't waste them again. I do love Christmas cards but I'm generally too disorganized to get them out and I've moved so much that most people have just stopped trying to send them to me over the years. Very sad! I have to admit, as much as I love receiving Christmas cards, I have become very lax about sending them. When I was first married, we were both working so we received cards from office, friends, family, and friends we kept in touch with from college. We are both retired now, so the cards we receive are mostly from family and only a few from former work friends. I should probably pull out the address book and make an attempt to reconnect with old friends. I love to send all sorts of cards for all sorts of holidays. Christmas is not exception. I even get those special stamps to make it a full package. But just like you, I don't get as many any more. People who get my cards are the only ones who send one back. And e-cards don't count in my book. I love getting Christmas cards and do try to send them every year. This year, it's not going to happen though. I have noticed, like you, that the tradition of sending Christmas cards is disappearing. It's not being replaced by e-cards either. I do think they're being replaced by social media though - typically I'd always send a card to someone that I might not see or talk to. Now Facebook is the easiest way to keep up to date with those I don't see often. Very generous giveaway and hometown is one of my fave lines. We send lots of cards with good intentions to write lots in them but time gets the better of us as usual and everyone gets a couple of lines. Maybe next year! I agree with you about Christmas cards; my mom sends out homemade cards every year, and my family does a newsletter, and we receiver fewer and fewer cards in return. It makes my parents sad, since that's what they're used to. Me, I'm in my early 20's and don't have a family yet, so I have never really sent out a dedicated Christmas card. As for Countdown to Christmas, I love the line, and have used it to make stockings, a quilt, and used it in my tree skirt! I send out cards every years, especially since we have a son so family, who aren't are Facebook, can see the baby....If you'd like, you can e-mail me your address and I would love to send you a Christmas Card as well!! I absolutely love Christmas cards too!! I think so many people are going electronic - which is just not the same. I love seeing updated photos and to hear what everyone is up too. But I like to receive them in the mail. Thanks for sharing the beautiful fabric! Cute cards! I never get any so I stopped sending them. Next year however I want to make a postcard of my girls to send out. Love the cards-- who doesn't? Not a fan of Christmas cards, actually, or cards in general. I just don't know what to *do* with them, you know? I send out about sixty or so every year but I also notice we are receiving fewer and fewer! I love to send Christmas cards and will continue to send the same amount each year even though I get fewer in return each year. I like Christmas cards, too! Both sending and receiving :) Thanks for the chance to win! I have not sent out Christmas cards in years. I guess I lost the spirit. Maybe next year. We love cards, I do ones with pictures of our girls on them. We tend to send out more than we get...but oh well, tis the season for giving! I send them out and love receiving them in the mail! I love sending photo cards! We've never been very good about sending cards- hoping to work on this! Thanks for the chance! We get very few Christmas cards, and send even less. But we live with hubby's grandparents and they get HEAPS! Goes to show the generational differences, hey?! Thanks for the giveaway, so generous of you!! I love getting Christmas cards and try hard to send them every year, but my list is getting shorter as to who I send them to! I love getting Christmas cards, but have noticed we get fewer as well. I have this wire tree that hangs on a door and holds cards - I only have one in there right now. I did some awesome cards last year. This year, no family pic, but I'm sending out cards anyway. We've only received one so far. I don't get it - it's so much fun to choose a card. LOVE your red truck, by the way. Very cute card you have there - glad you included the grandsons! I love sending Christmas cards. There are people in my family who have never sent me a card but I still send them ours. I have a feeling it would be missed if we didn't. I figure maybe people can't afford the "luxury" of cards, or the postage which is why they have dwindled over the years. I still think it's very important to most. I've never been good at getting Christmas cards out, so I finally gave up - but I love receiving them! I LOVE LOVE LOVE giving and getting Christmas cards. I'm thinking maybe of posting on my blog if people wants cards I will add them to my list. I love getting them also, so maybe they would add me to theirs. It's just a thought thats been running through my head this past week. Hi I love to receive Christmas cards every year and send them out but I too have noticed that they are become very few that send out cards now. I'm kind of famous (in my household of two) for buying cards and then not sending them out. Even worse frequently I write them but just can't seem to stamp and mail them. I love Christmas cards! My grandmother always got tons when I was growing up, and displayed them all around her house. I love to get cards and send them. It was tough to get a picture of all of us this year. Love the give away. I love getting and sending Christmas cards we make ours every year. I send cards every year and love getting them too. I adore Christmas cards! But never get the same amount back as I send out! I hope you get lots this year! I only send cards these days to family that don't live nearby or live overseas and I like to include a letter of the years' happenings of my family and adult children (it makes me keep a journal of the year).I found most friends just message via facebook these days. I send Christmas cards every year and I really look forward to getting them. I spend a lot of time picking mine out and I hope people like them! Seems Christmas cards are on the way out down here! I have received ONE in the mail! I still send cards, and love receiving them. We hang them in our entry and it makes a lovely decoration. I agree with you! Cards are enjoyable to receive, but we have been getting fewer and fewer. Love your Christmas photos, I did a similar one with photos of our four grandchildren. I love Christmas cards and especially love receiving them. It is starting to bother me at how much paper, travel, gas, etc. it all entails though. Thanks for the giveaway! This year I made a Christmas cardholder wallhanging that you might be interested in: http://quiltmatters.blogspot.com/2011/11/tgiff-seasons-greetings.html. I love to send christmas cards and enjoy receiving them even more. Especially when there is a long catch up letter of what has happened in the last 12 months. I love sending Christmas Cards, and I just LOVE getting them in return! I hate that people aren't doing it as much any more. lovely giveaway, thank you! I love christmas cards.. we make them every year with the children's artwork and personal letters. since this is the only time of the year when we use the postal service, it is sort of a special occasion for the kids too! i liked sending christmas cards when i was little. but nowadays i use e-mail and phone messaging to send out greetings. sad isn't it. We also don't do Christmas cards anymore, but I remember when I was a kid we would send and receive tons. Love the fabric! Thanks for the chance and happy holidays to you and your loved ones! I send lots of cards - in fact that's what I should be writing now! Love the black/white/red Christmas prints. Love to get Christmas cards, hate to write them. Will send a few this year, but it is just too expensive to spend lots as I live on the opposite side of the world to my family. I love to send handmade Christmas cards every year. But it is true that people is losing this tradition. Anyway, I will continue sending them! I love to receive & write Christmas cards, but each year ther are less and less. I guess people just don't have time? I love making and sending cards, but I don't send them out to everyone and everybody, just the select few I know will appreciate them! Usually I don't expect a card back as I know few people that still send them, it's just a nice fun thing to do! I love to give and received handmade christmas cards. The truth is I love Xmas cards but I don't send them any more... terrible I know. terrific giveaway! Love the photo of both of you with your dogs in the pick up truck (I'm from Spain where you don't see many pick ups so I love them). I do love getting cards, sending them is a chore though and Hubby moans about the costSo I make cards usually for family. I too love to get Xmas cards. It is a great time to catch up with family and friends, catch up on all the news.We lead such busy lives these days that we need a time set aside to do this. Thanks for the giveaway. I love sending and receiving Christmas cards but like you, I've noticed they're getting fewer! I love receiving Christmas cards. I used to make my own, but with 5 boys running around here, I just don't have time! I send out picture cards, and love to receive them too! I really like Christmas cards, but this year is the 1st time I made my own and sent them out in years. I think it will be something to come back into style. Lovely giveaway, thank you. I love getting Christmas cards. I hang them up as I get them, so can look at them thru the season. Merry Christmas. I do Xmas cards every year, either hand made or photo. I love getting them but have found the same issue with less and less arriving in the mail each year. Sigh... I get so few back that I stopped doing handmade x-mas cards. So far this year I have got one. Last year I mailed out 50, the year before 75 handmade and the year before that the same. I maybe got 15 or so back. Just doesn't seem worth it. My cards are all handmade so I don't send a ton. I'm better about hand delivered cards than I am about mailed ones. It really is quite expensive to send tons anymore! I still love getting Christmas cards.. and we got a few postcards last year too! I still get a thrill out of snail mail! I used to send Christmas cards to friends but not anymore since we have the internet. My friends used to sent me Christmas cards when we are still in school time. But, now they all sending me a Christmas e- card..
You're right. I like Christmas cards, but sometimes it just doesn't seem to be worth the money. I might send out a few to some special people, but I'd rather save the money and send out an email with pictures! I still send out Christmas cards, though not as many as I used too. Thanks for the giveaway. Not a christmas card person:/ but I do love receiving them! Your pic is very cute! I never send them out myself, but I love receiving them. I keep in touch with people throughout the year though, through my blog and through facebook. i'm seeing the same trend. i, too, like sending out christmas cards and see very little in my mailbox. however, my email box gets its fill. with stamps continuing to raise, ecards are much more economical. I'm with you -- I love Christmas cards! I was thinking about passing on them this year (so little time!) but my Mom says she looks forward to it every year, so after hearing that, I think I'll have to persist! I love receiving them, but I can't manage to get them out. I think sending cards to people I see everyday (like my sister or parents) is silly though. A card with just a signature doesn't do much for me. I do like when they have photos or notes in them. This is true whether I'm sending them or receiving them. We send out cards every year and we have been receiving fewer back... but we always include a 'Christmas' recipe kind of as a little gift to freinds. I don't do Christmas cards -- I figure that facebook and my blog pretty much fill that purpose. But it's fun to get them! Thanks! I love christmas cards although I forgot so often to send some... most because at the end of the year I don't even find time to get christmas presents because all deadlines for work reports and stuff like that come together. I love sending and receiving cards. I actually just keep them all in the same basket that I pack away after Christmas so that I can look at them year after year. 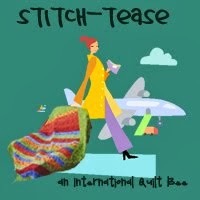 Hi Cindy, from a sewing summit friend! I'm with you - I love to give and send Christmas cards. It is a special tradition and I hope it stays strong! I love to get Christmas cards, but we've never sent them in our 3 years of marriage. I always think "next year is the year!" I especially love picture cards. It's great to see friends that I don't get to see in person anymore! I love Christmas cards and also notice not that many. Oh well. I just send out a few to special people! Thanks! Cindy, you look so beautiful in your christmas card! I am a big fan of christmas cards and I send them every year. I have a humongous red magnetic board where I put up all of the ones that i receive. To be honest I would rather we didn't exchange Christmas cards. If we send them it is purely duty and we don't really enjoy receiving them. Sorry. Not what you probably want to hear. I love christmas cards but we don't really get many! Well I was down in my sewing room cleaning out a cabinet and what do I find but all this wonderful paper to make Christmas cards with and so I made 40 of them. I did not send out any last year but this year everyone on the list go a homemade one. PS I made most of them at work but don't tell my boss. Happy holidays lauri (dot)rymar(at)gmail(dot)com I am not taking any chances of missing out on this wonderful giveaway!! Christmas cards used to be a big thing, but now half the ones we get (far fewer than previously) are year-long detailed explanations of everything our relatives or friends did for the year.... that's a bit much. I've started sending out ecards to those who use the Internet because I can include a number of color photos from places we've been. Then I can also print out some text to include with the physical cards that I send to others. I used to send Christmas Cards until the postage prices went up so high. I still love to get the photo cards from friends! We do family photo Christmas cards every year, and most of the ones we receive are the same.. I love to put everyone's photos up on the bulletin board! I love Christmas cards, but I'm sure running behind this year. Like you, we used to send a lot, but didn't get very many so we sort of started cutting back. Not it seems like we've gotten more and we haven't sent any. I really need to get them ready the week of Thanksgiving to get them sent. Yours is very cute! This is the first year I am not doing Christmas cards. We never had personal ones like yours. Those are the ones that I really loved to get. We don't really do cards, no body sends them and we don't either. I tried a couple years, but always forget to get them out. I am one of those who have given up on Christmas cards. I love handmade/homemade Christmas cards and try to make and send them too, but I only manage to do it once every two or three years. I think sending cards is a great way to let someone know you were thinking of them. I do agree that they are getting less and less, might be due to E-cards. I love the giveaway! I love giving Christmas cards. I don't receive very many anymore, and it's fun to see what everyone has been up to over the year. Often, the cards I do get stay on the fridge for the full year until I get the following year's cards. I do love dropping a little note in the mailbox for all of my loved ones, though. love getting christmas cards and i do send a few-we spend more time making christmas gifts/goodies. I send xmas cards out all the time. I love getting them in the mail and I know that some people don't like doing them, but its nice to feel like people are thinking of you once a year! OMG, I LOVE your card. We used to send out so many as well, but with the web and FB, I think people just connect in other ways. I still love getting them but b/c we would always send way more than we received, we just stopped. Maybe we should start back up! Thanks for the chance to win those great prizes!! I love sending Christmas cards! It does seem that many Christmas traditions are falling by the wayside. I know many people who do not bother to put up a tree, saying that it is too much work. I would really miss it if we did not have a decorated tree~! We send one for New years instead of Christmas, yes this started because I was always late getting them done but soon it became our tradition and a great way to start the new year with everyone. I love sending and receiving Christmas card! It seems every year we receive less cards; but I still enjoy sending them out. I love to receive Christmas cards and still send some but not as many as years ago. Thanks for the chance to win. I enjoy getting Christmas cards, but am absolutely terrible at getting them out. Yes, I just realized the same thing. We haven't actually sent any out this year...yet. But we've received far fewer than usual. Hard times maybe? You are correct fewer and fewer coming in, but I still send out the same. i've never done christmas cards as we don't celebrate christmas, but i do still receive some. I'm sending Christmas cards this year for the first time in ages. I love getting them. That is probably one of the best pics I have seen for a card. My husband and I couldn't get our family together for a pic either. I will probably end up just mailing plain cards. I do love to receive them especially if there is a pic in them. I love sending card out each year. And I love receiving them as well. It's nice to keep in touch with friends. I think email and the cost of postage has contributed to the decline in sending Christmas cards. My Mum does a family Christmas letter each year which she send out to everyone with the update of all our families for the year. I will send a few Christmas Cards but it doesn't seem to really be the done thing with most of my friends. This is the first year I sent out Christmas pictures. I didn't write a letter...that's what I have my blog for. Fantastic photo. I know your family and friends enjoyed receiving it because it's personal. Only once has my family sent a photo card. Anyway, I usually choose our cards every year. I am a procrastinator, so my hubby swoops in and sends cards to his friends, family, and coworkers. By the time I get myself in gear, the supply of new cards is nearly gone. I have to dig out leftover cards we've held onto for several years, so my recipients get reruns. I am sure they don't remember. At least they know I am thinking about them. Great giveaway! We always send out holiday cards with pictures of our children. It's a nice way to keep in touch with far away friends & family. I love sending Christmas cards! Last year we surprised everyone by signing "& Baby #5" at the bottom! That was a fun way to announce we were expecting! I love sending and receiving Christmas cards. I still like "real" mail. I receive very few cards, though - just my cousin's yearly picture of her kids. We never quite get around to cards. It's been years since we sent them. We do receive some each year, which always makes me feel like I should have planned ahead better. Maybe next year? I've given up on doing cards...we sometimes send out e-cards. We're lazy and cards seem wasteful (but sweet). I don't do Christmas cards. Thanks for the giveaway! Merry Christmas! I have mixed feelings about Christmas cards - I love the ones with a photo or personal note, but I don't really see the point of just signing your name to one. It seems wasteful. I love Sweetwater fabrics! In our Going Green and tech reliant society I am not surprised by the lack of actual Christmas cards being sent out. Poor postal workers. I was never a fan of getting Christmas cards but I do think as a society we need to send more Thank You cards and have more face to face interactions. Love Christmas cards - all of them. People send them to say hi, even if they don't have time for a note. Photos are the best. Thanks for the give away. Cute grandkids! I love to send out Christmas cards and receive them too. I love receiving Christmas cards! I send them faithfully and it really disappoints me to get fewer and fewer. I've never sent out Christmas cards, probably because (a) facebook keeps everyone updated that I care to keep updated, and (b) I celebrated Chanukkah for a bit (though my family opts for Christmas) and am only recently becoming more OK with the holiday. I love sending out Christmas cards each, this year however it isn't going to happen. I usually include pictures of celebrities that I meet at work but didn't get any pictures this year. I like receiving Christmas cards from the people we don't see very often. It's nice to find out what they've been up to, see the photos of their families. We tend to send out cards after the new year has started. I opt for the Season's Greetings kinds of cards because of that! There is just so much going on right before Christmas that we can never get our cards written or mailed out in time. I love sending and receiving Christmas cards, though I am behind in getting mine out this year. Gotta stop entering giveaways and get them finished! :) Thank you for the chance to win. I used to do Christmas cards, but it got too costly to send them once we moved out of the US. The kids over here (in UK) exchange little christmas cards with their classmates though, kind of like how US kids exchange valentines....but they don't do valentine cards over here! Usually I do all our Christmas cards, but this year I have delegated the responsibility to Mark (my other half) consequently they are still sitting unwritten in a pile on the stairs, and every day there is an argument about when they will be done!! I do send christmas cards, but not the personalised photo types. Just store bought ones. I no longer send Christmas cards. I find I tend to keep in touch with my family and friends via texts, emails or my blog now. THakns for the lovely offering for the giveaway! I just love both of those fabric sets.....sigh. I love Christmas cards, but it's true, we get fewer and fewer. I sweden, they sell and send Christmas postcards, and I really love that they make so many reproductions of the older style cards. They have pictures of gnomes carrying around bowls of porridge, for example, or dragging big sheaves of wheat to feed to all the birds and barnyard animals on Christmas Eve. Really a lovely tradition. I try to make cards when I can, but I don't always get to it. I seem to get more cards every year. To make sure I send them, we order the picture cards so all I have to do is stick on address and return labels. If I had to handwrite everything, I'd never send them.